This week Doug, and his crew, Eddie Lockey, are competing in the Championship of Champions. Doug and Eddie are both Butterfly and Laser sailors but it was Doug's Butterfly National Championship win that allowed them to qualify to apply to sail in the CoC. The event is being sailed in C-Scows and neither Doug or Eddie have ever sailed a C-Scow before. It's a big Butterfly with a sail about 3 times the size of a Butterfly. They are now equipped with their black and yellow copy of C-Scows for Dummies and getting ready for the practice race today before competing for the next 3 days. While I hope that they do well every helmsman on the course won a national championship last year so they have their work cut out for them. Thank God Eddie has scow experience!! We will be cheering for you Sea Scowts. Well good luck guys. Best to look around for a gorilla to sit between you two if the wind gets up! We learned in the practice race that we cannot start like a Laser. Were well-positioned below another boat, gave the boat a little pump at the gun, and the boat said "huh?". Got rolled by the fleet. Note to self: this is not a Laser! Very Nice early fall morning, fog on the lake, should be a good day of racing for the D guys. The wind should fill in and be 5-10 NW. Stacking on the line and your dead in a C boat. I bet they learn plenty today. JUST DON'T SAIL THE MIDDLE. Good Luck. Good luck. 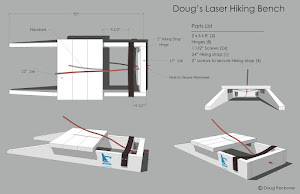 Hope you can make it out to the Laserpalooza regatta at the AYC next week to tell us about it. First race 10th place in the middle of the fleet. One place behind Bora. Not bad. Remember five of the top six boats in the first race are all C Boat skippers. Day 1 - practice race, 12 out of 16. Bad start. Day 2 - 1st race, they were 10 out of 20. They didn't like the feel of the boat they had in the 1st race. They rotated to the second and Eddie noticed a weird hook in the sail as the new crew sailed the boat away. They've stopped for lunch prior the 2nd race but like the feel of next boat better. Anyone have a clue whether their adjustment of the sail might have caused a hook in the sail on the first boat? Yep that would be operator driven. Today looks like a low side day. Wind out of the West pick a side. It's like watching a train wreck. They just keep sliding to the bottom of the standings. They've figured out that they don't have the speed of the fleet. They're starting in the right place, going the right way, and just getting rolled. They don't know why. They've figured out that they can't point with the fleet. They're having to foot more than anyone but they don't know why. They've figure out it's not the boat. They jumped on the boat that won the previous race and it suddenly became a pig. They don't know why. They know they aren't improving with each race. Doug says he's realizing that he sails by feel more than anything and he simply can't get a feel for this boat. They're learning that doing well in a boat you've never sailed before isn't so easy. That's not to say that they wouldn't do better than most of us but they aren't doing as well as other national champions. All in all, I'd say this is a fantastic experience for Doug. He's been humbled. Even better, he's been challenged. That alone was probably worth every penny. Plus, they're having a really good time. So, the good news is that Eddie was a fantastic crew. The bad news is that I never did figure out how to make C-Scows go. I was wearing my hat cam and will post a video so that people can enjoy the highlights of my learning (of lack of learning) experience. Doug, I felt your pain! I'm not sure if all scows have the same tendencies, but I've sailed some and from those experiences, I found they were pretty similar. As a 9 y/o I learned to sail on a scow, the South African Dabchick, and went on to sail other scows like the Tempo and Fireball. I'm a little mystified by your experience though, as the Butterfly is a scow and I'd imagine they must have similar sailing characteristics? Anyway, I do think that you would have benefited from sailing the C Scow in a decent 12-15 breeze first to "dial in" to the characteristics of the boat and learn the feel. From that reference, you can then scale down that feel and what might have felt like "no feel at all" for the first time scow sailor, becomes "aah" moment. Scows seem to be much more sensitive to trim, as you must have realised. The right amount of heel is critical, as is fore/aft weight. If you must err on fore/aft trim, make sure it's weight biased forward as weight even slightly too far back kills it. 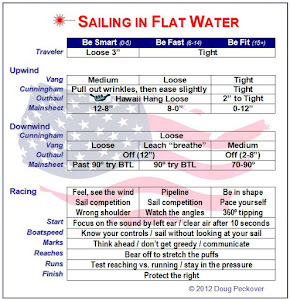 Upwind, you have to trim to keep the helm as light as possible, and let the boat almost steer itself. That means constantly playing with vang, sheet, outhaul and last of all, Cunningham. It's totally unlike a Laser where you can be aggressive with tiller, body weight and sail it flat. A scow doesn't tend to like being "dominated", rather you must help guide it into its groove by sensitive sheeting, weight distribution and ultra sensitive helm work. As for pointing, a scow doesn't like to point high, nor too low, so it's a case of getting the telltales on both sides of the sail streaming 100% of the time and maintaining that groove at all costs. Downwind, "boom in the air" Laser style didn't seem to work so we generally sailed them heeled to leeward with the boom just off the water. I'm interested if this was the case with the top C Scow guns as well? As the breeze builds, then the scow prefers to be flat on all points of sailing as they can plane much sooner than other boats. From this background, I started sailing a Laser last year, and have had to unlearn what has been imprinted on my sailing brain, and have had to relearn all new skills, sort of the reverse of what your experience has been. Wow, thanks for all of your comments. I tried to copy the boats around me and just could not find the groove. Sure, it was a good fleet but I was and am lost as to what I was doing wrong. My instincts were to foot until we had speed and then slowly head up... but we never got the speed and pointing right. Example: we rounded the bottom mark with a boat just behind. It wanted to continue and got impatient, so it bore off and sailed right through our lee as though we were not there. It was one of the hundred times I said to Eddie, "I just don't get it." I wore my hat cam and will post a video contest so that people can see how they would have done. I'm sure you would have done a lot better than me. In spite of the humbling experience, it was a great event in a beautiful part of the country with some really good sailors. So has anyone asked Eddie if he hears the line "I just don't get it" ringing in his ears in the middle of the night? It would make a great T-shirt line. 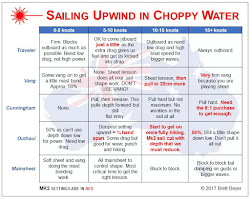 Scow Sailing - I just don't get it! with the same comment. Perhaps there is a way you are able to remove me from that service? do possess a relatively high rate of interest, they may be often less expensive than incurring late payment fees on unpaid debt. serve the various struggling homeowners.